FLINT, Mich. (AP) — Flint’s mayor reversed course Tuesday and recommended that the Michigan city beset by a man-made crisis that left the water supply contaminated with lead continue getting its drinking water from a Detroit-area system long term, saying a third switch would be too risky and expensive. Flint would remain a customer of the Great Lakes Water Authority for the next 30 years under the proposal instead of transitioning to a new Flint-area pipeline as planned. A previous money-saving decision to join the Karegnondi Water Authority in 2013 set the stage for the disaster when state-appointed financial managers controlling Flint in 2014 decided to temporarily tap the Flint River while the regional pipeline to Lake Huron was being built. The river water was not treated to reduce corrosion for 18 months. As a result, lead leaching from old pipes and fixtures caused elevated levels in children and left residents to drink and bathe with bottled or filtered water. During the public health emergency, there also were E. coli detections and high levels of a carcinogenic disinfectant byproduct. Experts suspect a deadly Legionnaires’ disease outbreak was tied to the water. Flint returned to the Great Lakes Water Authority, which services much of Detroit and the suburbs, in 2015. Last June, Weaver — who was elected after the crisis exploded — reluctantly announced that the city of 100,000 residents would still switch to the Karegnondi Water Authority pipeline after the system was ready, even though she had threatened to break the agreement before concluding it would have been too difficult. 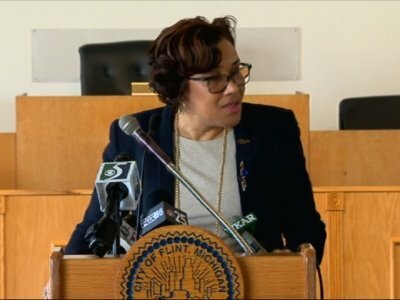 But she reevaluated that decision as a condition of Flint receiving $100 million in federal funding to address the disaster, the first wave of which is expected to arrive in May. A dozen options were explored, and Weaver said staying with the Detroit-area system under a new 30-year contract and using the local county as a backup would be the cheapest, costing $269 million over 20 years and keeping already-high customer bills in check. Flint estimates it would save $58 million by not having to upgrade its own troubled water plant to treat water coming from the new pipeline — more if the facility is closed. The savings could be used as part of a $177 million update of the city’s aging and deteriorating distribution system, including fixing leaky water mains and replacing 18,000 lead service lines, said David Sabuda, Flint’s interim chief financial officer. The city remains on the hook for $7 million annual bond payments to the Karegnondi Water Authority, but Weaver said that cost would be offset by credits from the Detroit-area authority in exchange for gaining Flint’s water rights to the KWA. The Great Lakes Water Authority would benefit by keeping Flint — one of its ten biggest customers — as a long-term customer and, in a partnership with the Flint-area authority and Genesee County, provide backup to Flint and other nearby customers. “This redundancy means that these member communities will be more secure in their water service should an emergency or issue with the GLWA system arise,” said CEO Sue McCormick. Officials hope the City Council approves the proposed deal by June. Weaver will brief council members Wednesday and hold a public town hall meeting Thursday. Bob Kaplan, acting regional director for the Environmental Protection Agency in Chicago, said the agreement is the “best long-term solution.” And Rich Baird, a top adviser to Gov. Rick Snyder — who has apologized for the crisis blamed largely on his administration — said it positions Flint to have a “state-of-the-art” water system with real-time testing and metering. After an event in Grand Rapids, Snyder told reporters that the plan is a “major step forward” that benefits Flint, the county and the Detroit regional water system. Flint can deploy the federal money “to the highest and best use,” he said. Flint Councilman Eric Mays said he understands the safety concerns over switching water sources again, but he will still scrutinize the mayor’s proposal — especially any diminishment of Flint’s stake in the newly built pipeline.